in different Christian environments i've been in, in the past, the emphasis was always put on "big" things. big events, big change, a big number of people believing in Christ. it's not bad to want those things at all, but in environments like that i often felt that if i didn't do big things then i wasn't doing anything at all. if i wasn't signing up for 2 years in Africa after college, i wasn't doing big things for the Lord. if i worked in Corporate America, i was just blending into the world. you get the drift. these things were not taught and they were never said. it is simply how i felt, how i took it. but i did feel like that for a majority of my life. people i knew were doing amazing things and my story didn't look like theirs. and a part of me thought that my story must be wrong. over time, the Lord made me realize that just isn't true. my story won't look like other people's stories, because we all have different stories. i can't compare & contrast something that isn't meant to be the same. the only measuring stick i need to use for my life is His Word. so, one thing i took away from environments like that is that my emphasis shouldn't be solely on the big. a lot of times, the big changes that we see come about because of the small moments in life. God works in the loud & huge events, but He works in the quiet small conversations as well. God works in the big, but more often than not God works in the details. 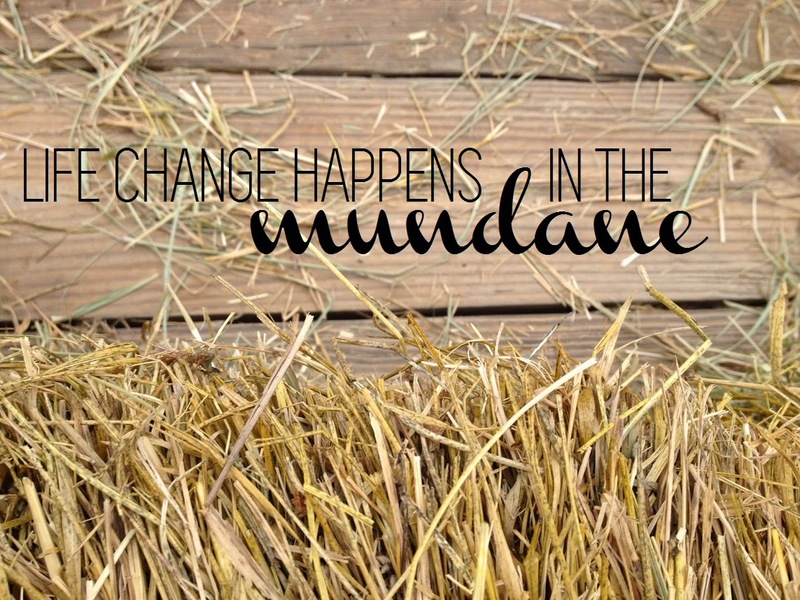 do we notice God in the mundane details of our lives? He's there. the ordinary moments far outweigh the extraordinary moments of life. we are called to be disciples in everyday life, in the extraordinary & in the ordinary moments. especially in the ordinary moments. He's there when you're up at 2am studying for exams. He's there when you're changing your child's diaper for the fifth time that morning. He's there when you're scanning someone's groceries to make ends meet. He's there when you're sitting at a computer crunching numbers 10 hours a day. the majority of life is filled with small moments and mundane details. and this is where life changing work is done. He uses small moments in big ways. so when you feel stuck or when you wonder how changing diapers is bringing glory to God... remember that God is found in even the quietest of places. look for the opportunities He sends you, they are there. 1. often times we miss God because we aren't still! such a challenge! !